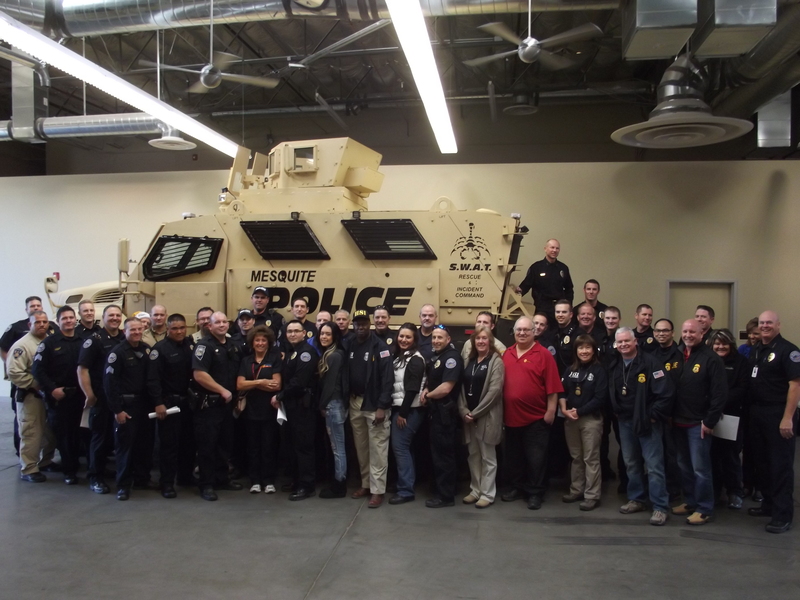 MESQUITE, Nev. — Chief Troy Tanner and the men and women of the Mesquite Police Department issued a news release this week offering heartfelt thanks to the city’s citizens, businesses and friends of the Police Department for their generous donations to the annual “Shop with a Cop” program. Tanner also extended thanks and appreciation to the men and women of Mesquite Elks Lodge No. 2811 for their continued annual support. The Elks provided lunch and a place for the officers and children to unwind after their whirlwind shopping spree. This week, Mesquite Police Department employees, along with agents from Homeland Security, Nevada Department of Public Safety, Moapa Tribal Police Department and Arizona Department of Public Safety joined together to make a joyful holiday memory in the hearts of many local youngsters. Donations enabled officers to take approximately 60 elementary-age children on their very own special Christmas shopping spree. The event kicked off with officers picking up their assigned children from Virgin Valley and Bowler elementary schools. The children were greeted by Santa as they entered Wal-Mart. Officers grabbed shopping carts and set off to help select much-needed items, like jackets and shoes. With the necessities out of the way, the children moved on to purchase gifts for mom, dad and siblings. Officers were busy helping kids, tracking each child’s budget, enjoying the delightful conversation of excited children and helping make big decisions. 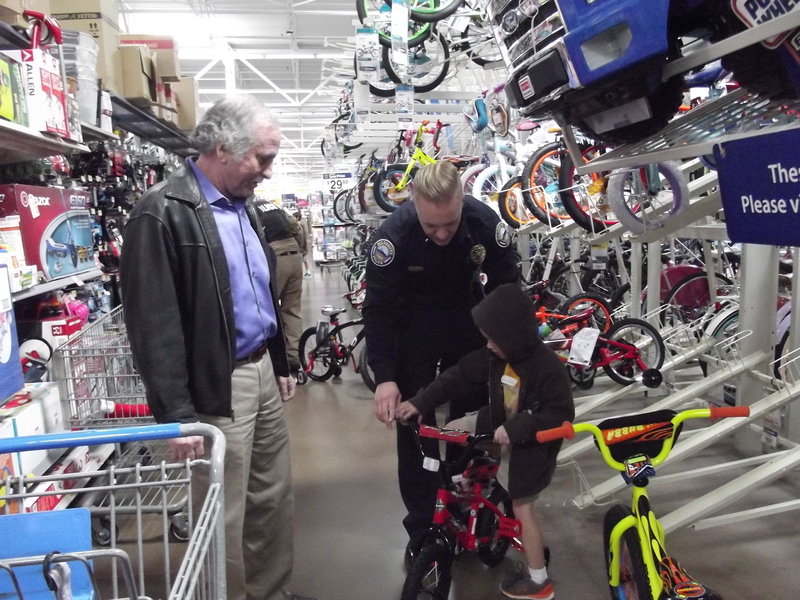 Police Lieutenant MaQuade Chesley and City Manager Andy Barton had quite the time helping one of the youngest shoppers select a bike. The youngster was convinced he needed a bike that was obviously too small. It was up to Chesley and Barton to convince him that the bike, when pedaled, placed his knees up to his ears and was not a good fit. As other options were discussed, Chesley deferred to Barton, an avid cyclist, who convinced the child that the wobbly training wheels on the larger bike could be adjusted for greater stability. The shopping concluded, and as officers loaded the trailers with gifts, they found an anonymous donation of bicycles. The donation of bicycles, and the impromptu cash donations by store customers during the event, was unexpected and heartwarming. A very busy day concluded with food, fun and relaxation at the Mesquite Elks Lodge No. 2811. The Elks know what kids like to eat and served up a feast of chicken nuggets and hot dogs. They had also arranged a special visit from Santa and Mrs. Claus, who had their picture taken with each child. A beautiful Disney-themed balloon arrangement expertly arranged by Moreno’s Rentals added to the children’s enjoyment. Merry Christmas greetings filled the air as the Elks sent the children back to school with full stomachs and a gift bag loaded with goodies.